The first Dairy Queen store opened in Illinois in 1940 with immediate success. The menu started out with ice cream and sundaes but soon expanded to malts, milkshakes, and banana splits. The company began to register its trademark products and in 1958 the Brazier logo on a DQ indicated that the store had their patented new cooking device using charcoal or electric to grill food. DQ rapidly expanded its Brazier menu to serve burgers, fries, hot dogs and fried chicken. In the era of post-World-War-Two population growth and the rise of the fast-food industry, Dairy Queen was very, very successful. Copyright notice: text and photos on this article are protected under a Creative Commons Copyright. Do not copy without permission. The Dairy Queen on the Safeway parking lot ran this advertisement in 1961 in the Terrace Viewer Community Club newsletter. Wedgwood’s Dairy Queen was built as a freestanding building on the parking lot of the Safeway grocery store, closest to NE 75th Street. The Wedgwood Dairy Queen was open seven days per week beginning at 11 AM and was open until midnight on Friday and Saturday nights. The listed menu was banana splits, malts, shakes, hamburgers, hot dogs, French fries, and fish. 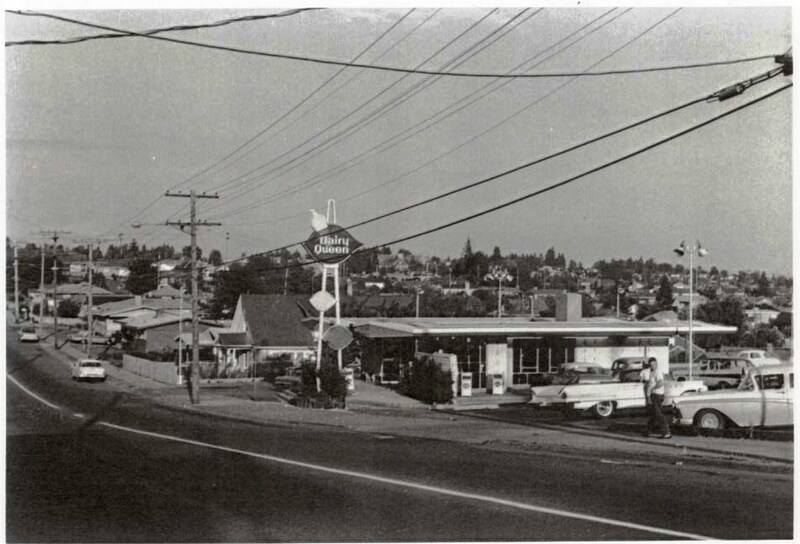 The Dairy Queen on the parking lot of the Wedgwood Safeway, looking eastward along NE 75th Street in 1963. The Morgan’s house, 3603 NE 75th Street, is at left of the DQ sign. Photo courtesy of Don Morgan. Do not copy without permission. It is not known whether the Dairy Queen operators were aware of Wedgwood’s hamburger drive-in protest of 1958. That year, alert Wedgwood neighbors had noticed that a so-called restaurant being built at NE 84th Street, present site of the Windermere office, had characteristics of a drive-in. The Wedgwood Community Club quickly and successfully acted to get the city building department and City Council to prevent the drive-in from being completed. We know that the community club desired to ban 19-cent hamburger drive-ins from Wedgwood, but there is no indication of whether they objected to the Dairy Queen. Then as now, NE 75th Street was the southern boundary of the Wedgwood neighborhood so the community club may have considered the Dairy Queen to be out of their purview. The Safeway site was zoned commercial and a ground lease from Safeway to Dairy Queen was legal. The Morgan house at 3603 NE 75th Street is now behind Safeway as rebuilt in 1965. The Dairy Queen at Safeway opened in 1960 and was only on the Safeway lot less than four years. By early 1964 DQ was notified that Safeway would remodel and take the space that DQ was occupying. The first Safeway building, which opened in 1951, had been built close to 35th Ave NE with parking on the sides and behind the building to the east. The new Safeway (the present building) was completed in 1965, and was positioned all the way to the east at the back of the lot. 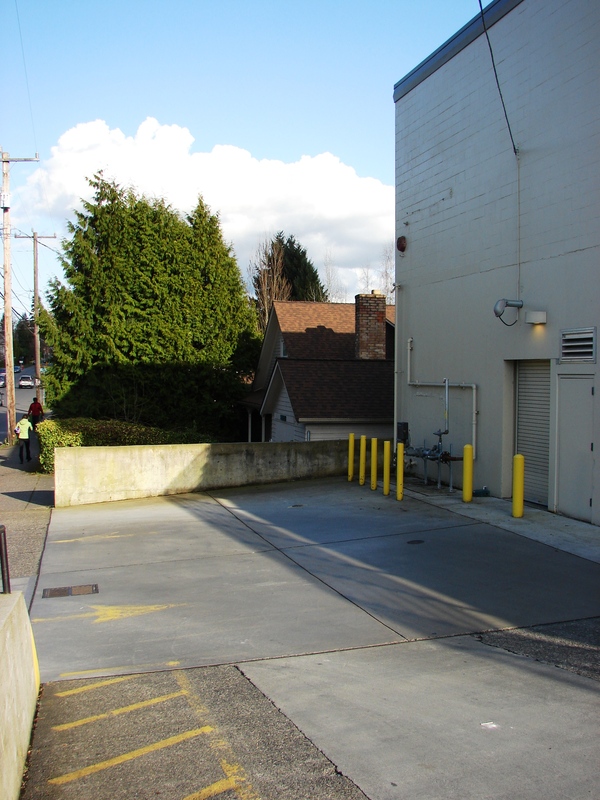 The site formerly occupied by DQ on the parking lot of the original Safeway building, is now the steep driveway out to NE 75th Street, because the Safeway parking lot was raised and leveled. 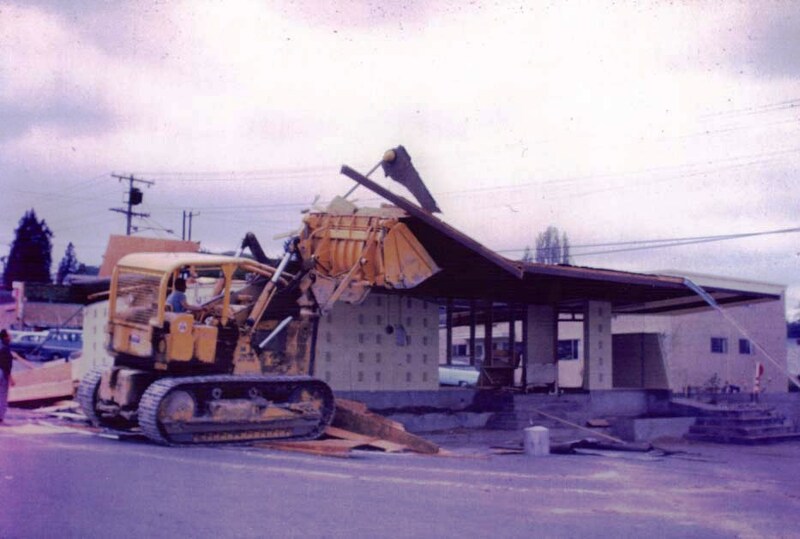 The DQ building on the Safeway parking lot was torn down after DQ moved to another close-by location in July 1964. The Wedgwood Dairy Queen was torn down in the summer of 1964. Photo courtesy of Don Morgan. Do not copy without permission. Records at Seattle’s Dept. of Planning & Land Use Microfilm Library show that in May 1964 the Dairy Queen operators entered into a lease for another building. Scott & Suess Builders Co. as leasor was to erect a building for the lessee (Dairy Queen) for occupancy before the end of July 1964. The building that was constructed is the present pizza building (Dominos/Zaw/and now Veraci Pizza) at 7320 35th Ave NE. At that time, 1964, there was a gas station to the south (today’s Chevron Food Mart) and another gas station, Richfield, at the present site of the Washington Federal Savings and Pinehurst Child Care, 7334 35th Ave NE. The new DQ building was shoehorned in between the two gas stations. 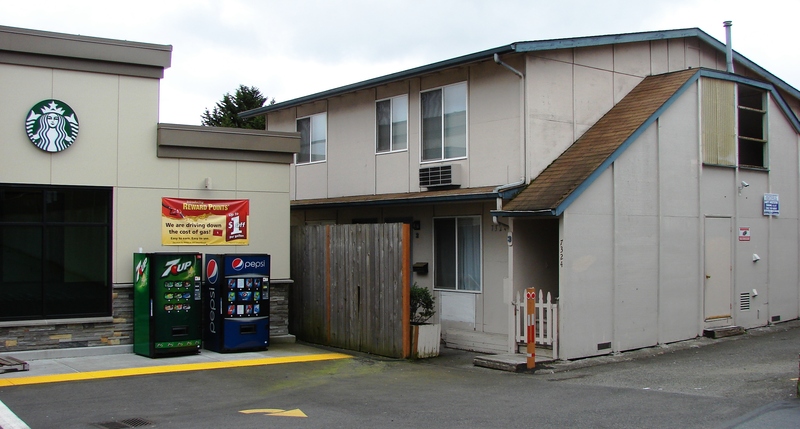 The Pizza building (now Veraci) at 7320 35th Ave NE was built for Dairy Queen in 1964. Originally there were gas stations on both sides of the building. Dairy Queen did well in the busy growing years of Wedgwood in the 1960s but by 1970 Wedgwood, along with all of Seattle, was feeling the effects of a recession. The downward spiral was caused partly by the Mideast Oil Embargo which choked off supplies to fuel-dependent industries such as airlines. Airlines cut back their flights; Boeing Aircraft had fewer orders to fill and they began massive layoffs. As people lost their jobs, many left Seattle, and the census showed that the population of Seattle was lower in 1970 than it had been in 1960. The loss of population caused some businesses to fail. Adding to the difficulty of the Boeing Bust years, in the early 1970s the Seattle Public Schools began a program of forced busing for racial integration. In my opinion the busing damaged the social fabric of Seattle, as it took away people’s sense of involvement, investment and ownership in their local/neighborhood school. Many parents moved out of Seattle to get away from the busing program. They moved to the suburbs outside the Seattle City Limits, where their children could attend a neighborhood school. In addition to the economic downturn of the Boeing Bust, the flight of young families out of Seattle caused many businesses to close because of lack of customers, especially businesses like Dairy Queen which appealed to young people. In May 2016 Veraci became the latest pizza restaurant to occupy the Dairy Queen building at 7320 35th Ave NE. After Dairy Queen, the building was occupied by Domino’s and then by Zaw Pizza. Seattle newspaper advertisements of the 1970s show that the Dairy Queen franchise was still viable, but all new stores were opening in the suburbs, following the population trends. Seattle’s new suburban DQs emphasized their abundant parking and larger-size buildings with adequate “eat-in” areas. The Dairy Queen franchise had evolved from a take-out or “quick bite” business to an actual restaurant where people would sit for a meal. The Dairy Queen in Wedgwood, however, was too small and there was no room to expand. Unemployment, population shifts and crime (which may have been related to the economic recession) began to affect the Dairy Queen and some other businesses in Wedgwood in the 1970s. The first records of armed robberies of Wedgwood businesses that I could find mentioned in newspaper reports, began to take place in this time period. The first armed robbery at the Wedgwood Dairy Queen which I could find mentioned in newspapers, was in 1969. 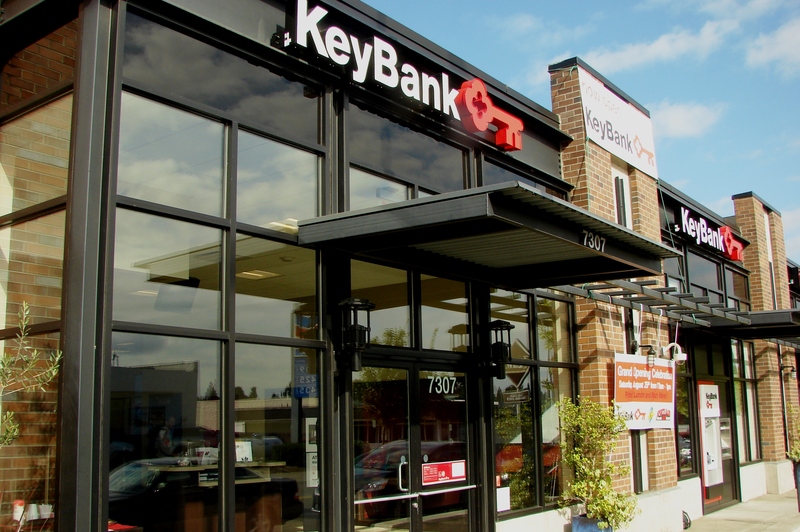 The Wedgwood branch of the Seattle First National (the present Bank of America at NE 85th Street) had a robbery in 1972 shortly after moving into their new building (next door to the previous bank building) and two new banks in the neighborhood had robberies that same year within weeks of opening (University Federal Savings in the present Wells Fargo building, and Peoples Bank in the present US Bank.) The Wedgwood Dairy Queen had from one to three armed robberies per year in the early 1970s, at least those that were reported in the Seattle Times. The March 1968 edition of the community council newspaper, the Wedgwood Echo, told of the little 600-square-foot houses which George Apostol was building. In January 1972 developer Robert Suess took these buildings and created an apartment complex with them behind the Dairy Queen building. See contemporary photo below. Along with changes in society and in the business environment, in the 1970s there were changes to the physical space around the Dairy Queen building at 7320 35th Ave NE which made it more constricted. The Richfield gas station closed, and the present building was built (today’s Washington Federal Savings and the Pinehurst Child Care Center at 7334 35th Ave NE.) This may have crowded the parking at Dairy Queen. DQ’s property owner, C. Robert Suess, began to construct apartments behind the Dairy Queen building, and these apartments took some of the available parking, as well. In January 1972 Suess obtained some of the “little houses” which had been the source of neighborhood controversy at the site of a failed development, Shearwater, on the streets around Decatur Elementary School. Suess moved the buildings, stacked them up by twos and created the apartments which he called Sherwater; today they are called the Wedgewood Cottage Apartments at 7318 35th Ave NE. The Wedgewood Cottage Apartments are the former “little houses” which were moved to 7318 35th Ave NE, viewed here from the east on 38th Ave NE. Photo by Valarie. By his reference to “Sherwater” (Shearwater) we can guess that Robert Suess had closely followed the events of that controversy and was sympathetic to the aims of the developer, George Apostol, to have his Shearwater project zoned for multiple, rather than single-home occupancy. Just noticed with interest your January 16 (1972) remarks about the new apartments in the Wedgwood area. There is truly a sweeping view from this point. Lake Washington and Mount Rainier to the south on a clear day are truly a picture to behold. The hills of View Ridge and the snow-capped Cascades to the east present a Utopian scene…..
You must be one of us in this area who has enjoyed the small pleasures of an ice cream from Dairy Queen while drinking in without charge the satisfaction of what the good Lord and the producers He has created have blended together for the enjoyment of all. That is, for those who care to open their eyes to the true beauty that surrounds us, regardless of whether they stand on commercial or residential zoning. (signed) C. Robert Suess, 7064 35th Ave NE, No. 22. Why did Wedgwood’s Dairy Queen finally close? This complex of buildings was built in 2005. It includes Starbucks (to the left of the photo) at 7303 35th Ave NE. The site had a Herfy’s Burgers in the 1970s and later a Godfather’s Pizza, torn down to make way for this new building. Photo by Valarie. Competition may have been the final factor which led to the closing of Wedgwood’s Dairy Queen in about 1978-1979, going by listings in the phone book. Directly across the street at 7301 35th Ave NE, a Herfy’s Burgers had opened in the mid-1970s. Herfy’s was a freestanding building with parking on all sides and a good eat-in area. The building later became a Godfather’s Pizza. The Godfather’s was torn down and the present complex of storefronts (“line retail”), including Starbucks, KeyBank, and orangetheory fitness was built in 2005. The superior Herfy’s site with its ease of access and abundant parking may have been the death blow for Wedgwood’s Dairy Queen. After Wedgwood’s DQ closed in about 1978-1979, as of 1980 there were no Dairy Queens within the city limits of Seattle. After some remodeling in 1980 the Wedgwood DQ building became the home of Domino’s Pizza. The next to occupy the building was Zaw Pizza; it closed in 2015. Then the DQ/Dominos/Zaw Pizza building underwent six months of remodeling for the opening of Veraci Pizza in May 2016. The Seuss’s dispute with the Beaverton city government went to the Oregon State Supreme Court in 1982. The Supreme Court sent the case back to Washington County (Beaverton, Oregon area) and it was still going on in 1984. 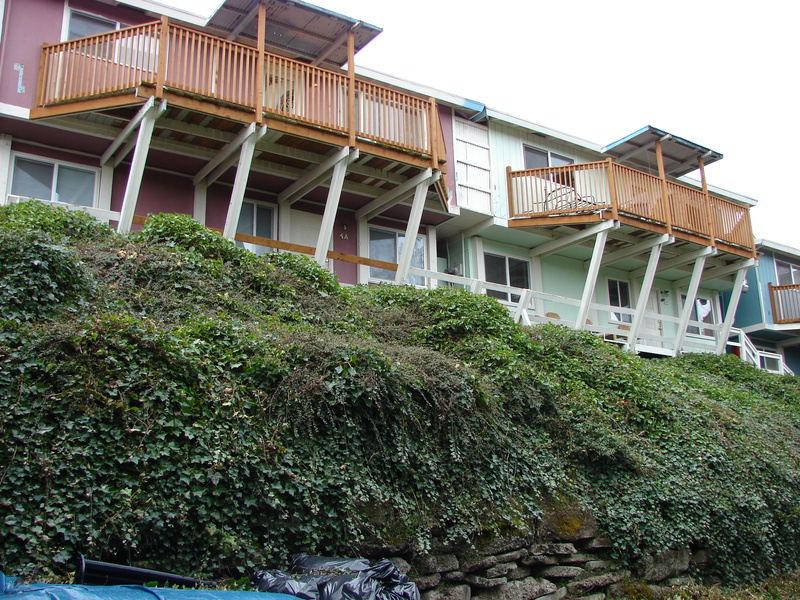 Like George Apostol of Shearwater in Wedgwood, Robert and Helen Suess tried to obtain multiple-family zoning for their Beaverton property so that they could develop it into an apartment complex. Our thanks to Don Morgan for the Dairy Queen photos. Wikipedia entry: Dairy Queen company history. Advertisement for the Wedgwood Dairy Queen in The Terrace Viewer, November 1961, newsletter of the Terrace View Community Club. That club’s boundaries were from NE 55th to 75th Streets, 35th to 45th Avenues NE. The Shoreline Historical Museum at 18501 Linden Ave N. has three copies of The Terrace Viewer newsletters of the 1960s in their archives. Seattle City directory listings 1960-1980, using both phone books and commercial directories to find the timeline of businesses. “The Census of 1970,” HistoryLink Essay #9426 by John Caldbick, 2010. Looking north on 35th Ave NE, we see the Herfy’s/Godfather’s Pizza building at the corner of NE 73rd Street. It closed in 2003 and there is now a Starbucks and another retail building in its place. At right is the Big Green House at 7321 35th Ave NE which was torn down in 2015. “Shearwater houses moved; land’s future uncertain.” The Seattle Daily Times, January 16, 1972, page 28. “Feedback” (letter from C. Robert Suess), The Seattle Daily Times, January 30, 1972, page 30. “Jury says couples land not “taken.“” Oregonian, July 3, 1984, page 55. The Wedgewood Cottage Apartments are behind the present Veraci Pizza. Puget Sound Regional Archives, Bellevue, WA; original property ownership notations. Department of Planning & Development Microfilm Library, Municipal Tower/20th floor, Seattle, WA. 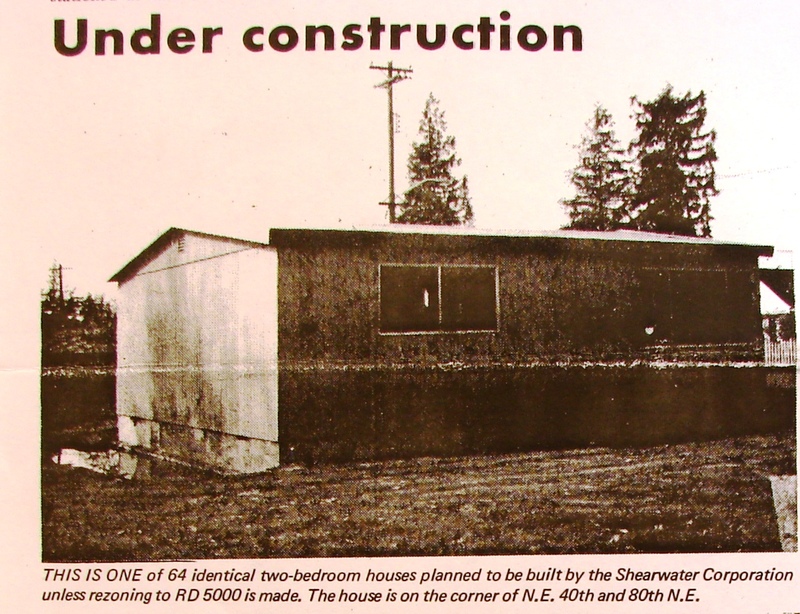 Permits & plans at Seattle’s Department of Construction show that in January 1972, C. Robert Suess moved twelve of the “little houses” from 40th and 42nd Avenues NE near Decatur Elementary School, and combined them to create the present Wedgewood Cottage Apartments at 7318 35th Ave NE. Safeway (at left) is separated from a duplex by a fence marking the property line. Since Safeway was remodelled in 2012 with footage added onto the front of the store, bringing it forward, the duplex can only be entered from one side. The duplex is on a different plat, not owned by Safeway. Robert Suess also built the duplex at 7324 35th Ave NE (squeezed in next to Safeway), the apartments at 3600 and 3601 NE 73rd Place, and the building which is now condos at 7064 35th Ave NE. The duplex at 7324 35th Ave NE which is squeezed in next to Safeway, was originally a one-story building. It was rented and used as an office by realtor Sam Spilk. Construction records show that later, Robert Suess added a second story to make the building into a residential duplex. This entry was posted in apartments, businesses, Shearwater and tagged commercial district in Wedgwood, NE 75th Street, Neighborhood History, pizza building, Seattle, Veraci Pizza, Wedgwood Safeway store, WPLongform. Bookmark the permalink. I grew up in New Orleans in the 1960s, and experienced my share of forced busing. I really had no idea that it was happening here in Seattle also. In some cities desegregation busing was court-ordered. It is a complicated issue, but I feel it did nothing to address the real problem which was segregated neighborhoods. Shuttling children around in buses only led to “white flight,” so the school system lost population. It made the economic condition of Seattle worse, to say nothing of tearing up the streets due to excessive traffic with buses and cars traveling to schools at a distance. This was a very interesting article. Thanks for doing all the research that went into this. I looked on Google Maps and it looks like there aren’t currently any Dairy Queens in the area. It’s cool to know why, and to learn something new about my new home. One of the things I did was to simply trace Dairy Queen through the phone books and business directories. These are available in the history department of the downtown library. There was a clear migration of Dairy Queen to the suburbs and all within the city limits of Seattle were gone by 1980. Today, Dairy Queen is doing better in some states of the USA than in others. Texas has more DQ than any other state.